As the gardening season comes to a close, now is the time to look back and reflect on all of the things your garden has taught you this year. What are you thankful for this November? Here are a few ideas to help you get your list started. I’m not sure what it is about autumn that stirs something inside me and spurs on the emotions of feeling thankful. Maybe it’s the approaching holidays, or maybe it’s the warm fall colors juxtaposed against cerulean blue cloudless skies. As I rake the neon orange and yellow leaves from the giant sugar maple in my garden, I think about all of the things I am thankful for as a gardener. Taking the time to be thankful makes me appreciate all of it a little more. I’m thankful for all of the amazing flowers and plants that color my world and make my soul sing. From the fragrant Bloomerang lilacs in spring to the bountiful Supertunias overflowing my containers in summer and my Limelight hydrangeas blooming prolifically in fall, I feel so incredibly blessed by it all. I’m thankful for the miracle of new growth in spring and the resilience of the hardy plants that fill my garden with reliable color, texture and fragrance every year despite the bone chilling winter. How strong they are compared to us gardeners who have to bundle up in down coats, warm hats and woolen mittens to survive winter. The sight of my Double Take quince, one of the earliest shrubs to bloom in spring, is absolutely breathtaking. Its brilliant blooms glow against the still-brown earth below and rekindle the gardening bug inside me every spring. I’m especially thankful that these particular quinces don’t have thorns, since thorns are not allowed in my garden. I’m thankful for the butterflies, bees and hummingbirds that grace my garden each year, feasting on the flowers I’ve selected just for them. They just can’t seem to get enough of my Vermillionaire cuphea and I can hardly blame them. It’s one of my favorites too. I’m thankful for the ample rainfall that comes every spring and fall, and if I’m lucky, summer too. 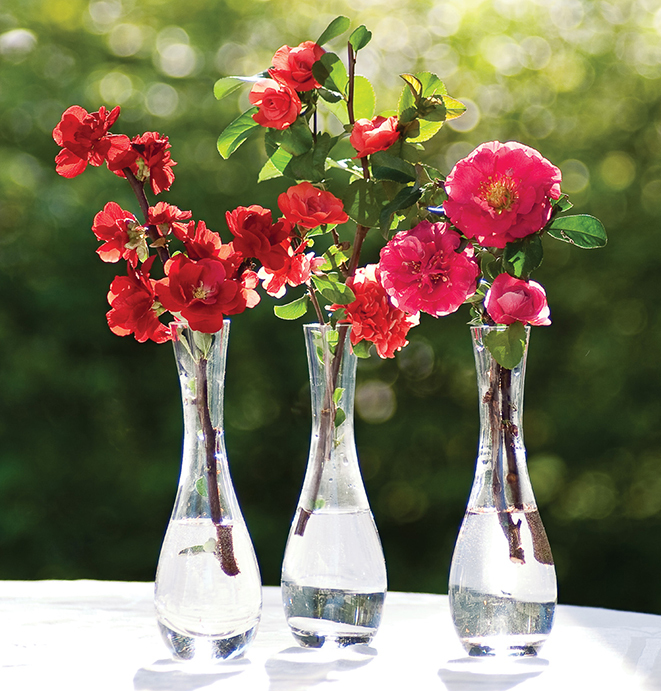 I know that not every gardener has this luxury and that my garden would look much different if there was no rain. 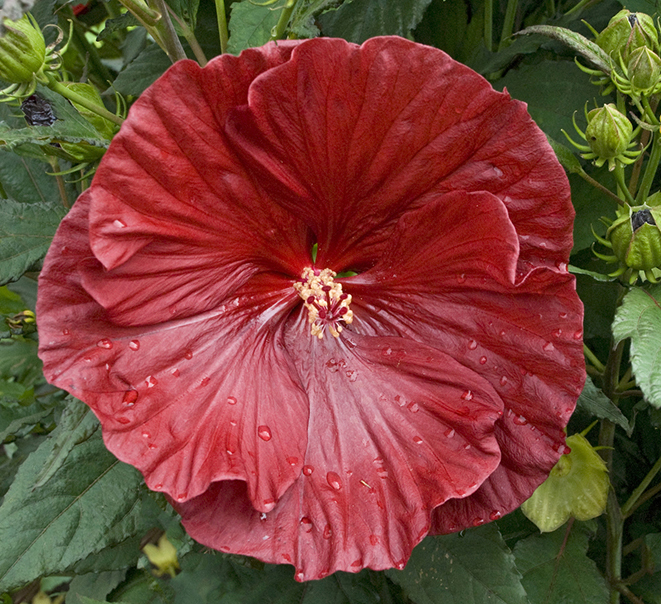 Rain makes the plants in my garden dance and sing with joy, especially water lovers like Summerific hibiscus which feed my spirit with dinner plate-sized blossoms each summer and fall. I’m thankful for the life-giving oxygen plants give off and the carbon dioxide they absorb from the atmosphere. Did you know that one fast growing forest tree can absorb up to 48 pounds of carbon dioxide every single year? Amazing! And this won’t come as a surprise to gardeners, but it has been scientifically proven that doing just five minutes of exercise out in a nature setting can boost your mood and self-esteem. 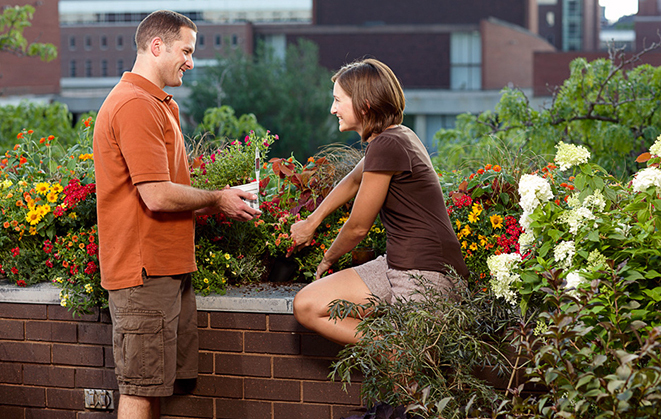 When is the last time you spent just five minutes in your garden? See why gardeners are such happy people? I’m thankful that there are a few plants that deer and rabbits don’t typically devour like my intoxicatingly fragrant Sweet Romance lavender and my shining yellow Lemony Lace sambucus. There may be no hope for my lilies and begonias when the deer come to visit but by George, there WILL be lilacs! I’m thankful for those plants that keep on giving a little bit more just when you start to think the gardening season is over. They’re like the horse that pulls out ahead in the end to win the race—just watch me now, they exclaim! 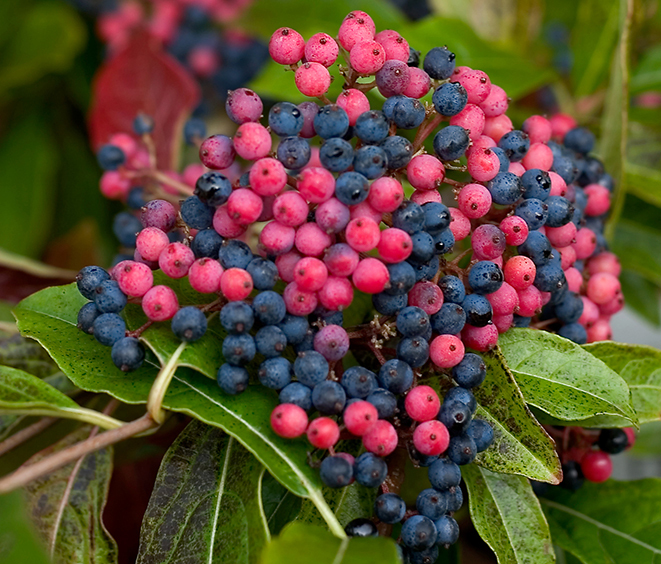 Like my Brandywine viburnum which produces the most exquisite pink and blue berries to complement its fantastic fall foliage. Or my cold-tolerant Superbena Vista Bubblegum petunias which seem to have no intention of ending their incredible show from the time I plant them in spring to the time I begrudgingly remove them when the first fall frost arrives. I’m thankful that Mother Nature gives me the winter to rest my aching back and take a little time to reflect on the lessons my garden has taught me this year. As Alfred Austin once said, “There is no gardening without humility. Nature is constantly sending even its oldest scholars to the bottom of the class for some egregious blunder.” No matter how many years I’ve been gardening, I learn something new every single year. Last but certainly not least, I’m thankful for my gardening community. I’ve always found gardeners to be such down to earth people, so willing to share their hard-earned knowledge, excitement over new plants and passion for their craft. 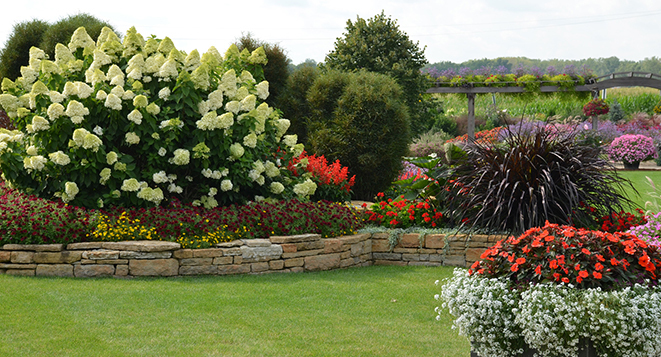 My gardening community lives all around me, from my parents and sisters who also love to garden, to the neighbors I’ve introduced to the hobby, to the avid gardeners I meet at events, and the gardening groups I participate in through social media online. All of these people have helped to shape me into the gardener I am today and I hope in some small way, I’ve inspired them along the way too. It takes a village to grow a garden. Find more to be thankful for at www.provenwinners.com.